So, the next-gen iPhone is right around the corner and expectations are higher than ever before, but will Apple match them? A day before the iPhone 5 or 4S launches, we’ll take a quick retrospective look at what we’ve seen so far from iPhones and the way Apple innovates. 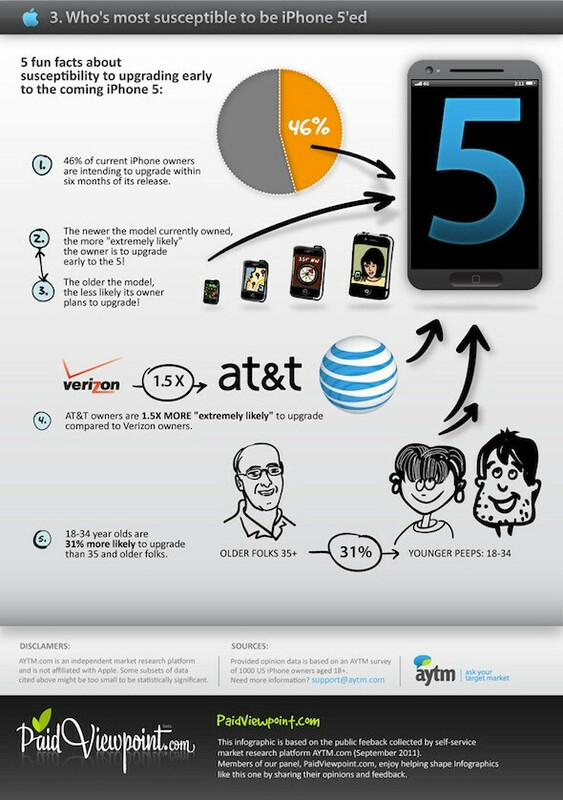 But not only that - the infographic below gives some precious details about how we use our iPhones. And for those who don’t own one, it’s also helpful as it gives a great insight on how long you can expect to use your phone each day, how many apps you’d download on average and which apps you’d probably end up using the most. First when we speak about the iPhone, though, we have to specify which one. 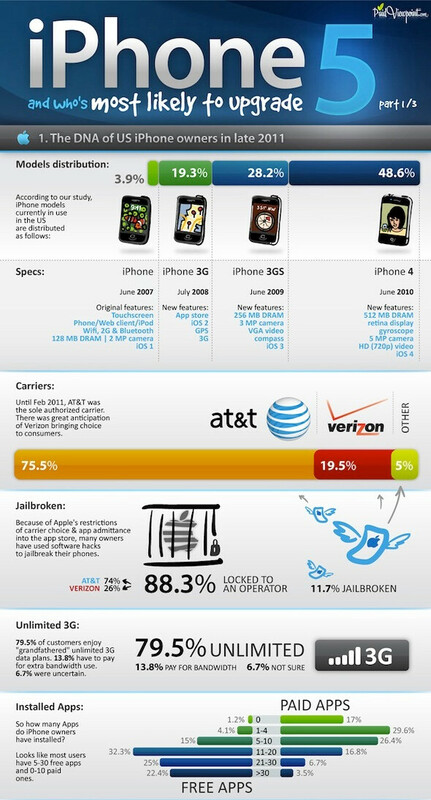 Stats show that nearly a half (48.6%) of all iPhone users actually have the latest iPhone 4. The iPhone 3GS is the second most widely adopted Apple handset with a share of 28.2%, trailed by the iPhone 3G with 19.3%. Just as you’d expect, the original Apple iPhone, which no longer receives updates and is stuck at versions prior to the major 4.0 release, is found in only 3.9% of cases. The difference between the first four generations of the iPhone is well illustrated in the speed comparison below. Secondly, the graphic shows that nearly 80% still use unlimited 3G data on their iPhones, something which might well change as soon as they switch to the next-gen iPhone, which will probably abide to carriers’ revised data policies. Interestingly, most users also have somewhere between 5 and 30 free apps, and 0 to 10 paid ones. Altogether, the iPhone might not cost that much money though as time - people said they spend an average of 2 hours daily on their phones. When it comes to the next-gen iPhone, which we are expecting to see tomorrow, the single thing that will have users upgrading is extended battery life. Second on the list were unlimited data and no long-term contracts. Finally, 10% of users are willing to quickly jump to the iPhone 5 if it offers Wi-Fi Tethering for no extra charge. Those reasons are quite a revelation for geeky folks actually as dual-core processors, 3D features and most avant-garde technologies in that order are far behind in the minds of the general public. The data comes courtesy of PaidViewpoint.com and is based on public feedback from 1,00 US iPhone owners older than 18, collected on market research platform AYTM this September, so the numbers are definitely up to date. We wouldn’t take it as statistically proven, though, as some of the data subsets might not be statistically significant. Nonetheless, it’s worth a look and a thought - what will it take for you to jump on the iPhone 5 ship? Forget about the critics, iphone is still a great phone to have. why all of the this? @dfgdf : Atleast I am concerned with what I want unlike you showing more interest in articles regarding Apple products and commenting on others' personal opinion. What does that make you, an ape? or a pig? I agree apples not dumb, they know what people want and they deliver. Iphone is a great phone but its too boring of a UI for me. If the iphone has a problem it exits the app instead of having a box pop up that says force close, basically the same. Dropped calls happens on iphones and android phones, U probably just have at&t. Sgs2 has no lag because android is still getting better. lol then you should change your user name, just saying. Also don't give me that crap dude, I know all to well that the iphone can lag and has force closes. It just doesnt tell you it has, you can open an app and for no reason at all it will just send you back to the homescreen. That is the iphone's way of FORCE CLOSING you. And Dropped Calls? Hahahaha oh right the iphone 4 atenna issue was all just made up. Please, the iphone and every generation iphone has been made famous for having bad call quantity, bad signal strength, and dropped calls. If it shows up on Sprint, i am getting it! Bye bye BlackBerry and hello iphone. Going still have my Evo but I want to see how the other half lives and replace my BB with this bad boy. I agree with you, I AND YOU would be boring by the same interface. YOU AND I. But the average people who has found a simple interface he can quickly understand, and found some funny applications, this average doesn't want to change : he has something that works for him. he doesn't need to use many hours to understand how it works, how to configure it, how to invert the mistakes he have made... So I don't want Iphone because it would bore me...but it's not a problem, it's a selling argument for Apple ! And that's why you maybe (probably) have a Androphone and probably I will have one...but not my father and your aunt. Wrong ? The Iphones might not have any lag but it's because the phone doesn't do anything. You have a phone with a bunch of icons so why would it have lag and the battery last longer because nothing is running on the phone.The sgs2 doesn't have lag. sgs2 doent have lag because it is randomly shut off or because the battery died after 2 hours. it doesnt have time to lag. That's a really uneducated and foolish comment. The SGS2 does not lag as much as other phones because it is at the cutting-edge of processor and graphics speeds, while the apps and programs that can be run on android are still optimized to be run on as many phones(including low-end, 600MHZs) as possible, and thus are not that resource-hungry. Just wait 2 years, and SGS2 will start to lag, because by then the market's average processor speeds would've went up, and most programs take more resources for more functionality, higher resolutions etc. If you don't know much about Androids, just think how the iPhone 3GS used to be lightning-quick, but after the iPhone 4 was released and most dev's got more liberal with their apps' resource usage, the same, albeit updated, apps would run much slower on the 3GS, making it sluggish.